The QImage class provides a hardware-independent image representation that allows direct access to the pixel data, and can be used as a paint device. Qt provides four classes for handling image data: QImage, QPixmap, QBitmap and QPicture. QImage is designed and optimized for I/O, and for direct pixel access and manipulation, while QPixmap is designed and optimized for showing images on screen. 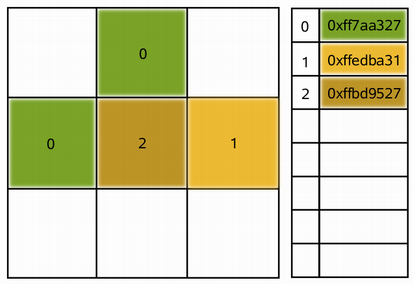 QBitmap is only a convenience class that inherits QPixmap, ensuring a depth of 1. Finally, the QPicture class is a paint device that records and replays QPainter commands. Because QImage is a QPaintDevice subclass, QPainter can be used to draw directly onto images. When using QPainter on a QImage, the painting can be performed in another thread than the current GUI thread. The QImage class supports several image formats described by the Format enum. These include monochrome, 8-bit, 32-bit and alpha-blended images which are available in all versions of Qt 4.x. QImage provides a collection of functions that can be used to obtain a variety of information about the image. There are also several functions that enables transformation of the image. QImage objects can be passed around by value since the QImage class uses implicit data sharing. QImage objects can also be streamed and compared. Note: If you would like to load QImage objects in a static build of Qt, refer to the Plugin HowTo. Warning: Painting on a QImage with the format QImage::Format_Indexed8 is not supported. QImage provides several ways of loading an image file: The file can be loaded when constructing the QImage object, or by using the load() or loadFromData() functions later on. QImage also provides the static fromData() function, constructing a QImage from the given data. When loading an image, the file name can either refer to an actual file on disk or to one of the application's embedded resources. See The Qt Resource System overview for details on how to embed images and other resource files in the application's executable. Simply call the save() function to save a QImage object. Geometry The size(), width(), height(), dotsPerMeterX(), and dotsPerMeterY() functions provide information about the image size and aspect ratio. The rect() function returns the image's enclosing rectangle. The valid() function tells if a given pair of coordinates is within this rectangle. The offset() function returns the number of pixels by which the image is intended to be offset by when positioned relative to other images, which also can be manipulated using the setOffset() function. Colors The color of a pixel can be retrieved by passing its coordinates to the pixel() function. The pixel() function returns the color as a QRgb value indepedent of the image's format. In case of monochrome and 8-bit images, the colorCount() and colorTable() functions provide information about the color components used to store the image data: The colorTable() function returns the image's entire color table. To obtain a single entry, use the pixelIndex() function to retrieve the pixel index for a given pair of coordinates, then use the color() function to retrieve the color. Note that if you create an 8-bit image manually, you have to set a valid color table on the image as well. The hasAlphaChannel() function tells if the image's format respects the alpha channel, or not. The allGray() and isGrayscale() functions tell whether an image's colors are all shades of gray. See also the Pixel Manipulation and Image Transformations sections. Text The text() function returns the image text associated with the given text key. An image's text keys can be retrieved using the textKeys() function. Use the setText() function to alter an image's text. Low-level information The depth() function returns the depth of the image. The supported depths are 1 (monochrome), 8, 16, 24 and 32 bits. The bitPlaneCount() function tells how many of those bits that are used. For more information see the Image Formats section. The format(), bytesPerLine(), and byteCount() functions provide low-level information about the data stored in the image. The cacheKey() function returns a number that uniquely identifies the contents of this QImage object. The functions used to manipulate an image's pixels depend on the image format. The reason is that monochrome and 8-bit images are index-based and use a color lookup table, while 32-bit images store ARGB values directly. For more information on image formats, see the Image Formats section. In case of a 8-bit and monchrome images, the pixel value is only an index from the image's color table. So the setPixel() function can only be used to alter the color of the pixel at the given coordinates to a predefined color from the image's color table, i.e. it can only change the pixel's index value. To alter or add a color to an image's color table, use the setColor() function. For images with more than 8-bit per color-channel. The methods setPixelColor() and pixelColor() can be used to set and get with QColor values. QImage also provide the scanLine() function which returns a pointer to the pixel data at the scanline with the given index, and the bits() function which returns a pointer to the first pixel data (this is equivalent to scanLine(0)). Each pixel stored in a QImage is represented by an integer. The size of the integer varies depending on the format. QImage supports several image formats described by the Format enum. Monochrome images are stored using 1-bit indexes into a color table with at most two colors. There are two different types of monochrome images: big endian (MSB first) or little endian (LSB first) bit order. 8-bit images are stored using 8-bit indexes into a color table, i.e. they have a single byte per pixel. 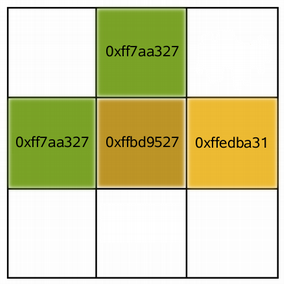 The color table is a QVector<QRgb>, and the QRgb typedef is equivalent to an unsigned int containing an ARGB quadruplet on the format 0xAARRGGBB. 32-bit images have no color table; instead, each pixel contains an QRgb value. There are three different types of 32-bit images storing RGB (i.e. 0xffRRGGBB), ARGB and premultiplied ARGB values respectively. In the premultiplied format the red, green, and blue channels are multiplied by the alpha component divided by 255. An image's format can be retrieved using the format() function. Use the convertToFormat() functions to convert an image into another format. The allGray() and isGrayscale() functions tell whether a color image can safely be converted to a grayscale image. QImage supports a number of functions for creating a new image that is a transformed version of the original: The createAlphaMask() function builds and returns a 1-bpp mask from the alpha buffer in this image, and the createHeuristicMask() function creates and returns a 1-bpp heuristic mask for this image. The latter function works by selecting a color from one of the corners, then chipping away pixels of that color starting at all the edges. The mirrored() function returns a mirror of the image in the desired direction, the scaled() returns a copy of the image scaled to a rectangle of the desired measures, and the rgbSwapped() function constructs a BGR image from a RGB image. The scaledToWidth() and scaledToHeight() functions return scaled copies of the image. The transformed() function returns a copy of the image that is transformed with the given transformation matrix and transformation mode: Internally, the transformation matrix is adjusted to compensate for unwanted translation, i.e. transformed() returns the smallest image containing all transformed points of the original image. The static trueMatrix() function returns the actual matrix used for transforming the image. setDotsPerMeterX() Defines the aspect ratio by setting the number of pixels that fit horizontally in a physical meter. setDotsPerMeterY() Defines the aspect ratio by setting the number of pixels that fit vertically in a physical meter. fill() Fills the entire image with the given pixel value. invertPixels() Inverts all pixel values in the image using the given InvertMode value. setColorTable() Sets the color table used to translate color indexes. Only monochrome and 8-bit formats. setColorCount() Resizes the color table. Only monochrome and 8-bit formats. For smooth scaling, the transformed() functions use code based on smooth scaling algorithm by Daniel M. Duley. See also QImageReader, QImageWriter, QPixmap, QSvgRenderer, Image Composition Example, Image Viewer Example, Scribble Example, and Pixelator Example. The following image formats are available in Qt. Values from Format_ARGB8565_Premultiplied to Format_ARGB4444_Premultiplied were added in Qt 4.4. Values Format_RGBX8888, Format_RGBA8888 and Format_RGBA8888_Premultiplied were added in Qt 5.2. Values Format_BGR30, Format_A2BGR30_Premultiplied, Format_RGB30, Format_A2RGB30_Premultiplied were added in Qt 5.4. Format_Alpha8 and Format_Grayscale8 were added in Qt 5.5. See the notes after the table. QImage::Format_Invalid 0 The image is invalid. QImage::Format_Mono 1 The image is stored using 1-bit per pixel. Bytes are packed with the most significant bit (MSB) first. QImage::Format_MonoLSB 2 The image is stored using 1-bit per pixel. Bytes are packed with the less significant bit (LSB) first. QImage::Format_Indexed8 3 The image is stored using 8-bit indexes into a colormap. QImage::Format_RGB32 4 The image is stored using a 32-bit RGB format (0xffRRGGBB). QImage::Format_ARGB32 5 The image is stored using a 32-bit ARGB format (0xAARRGGBB). QImage::Format_ARGB32_Premultiplied 6 The image is stored using a premultiplied 32-bit ARGB format (0xAARRGGBB), i.e. the red, green, and blue channels are multiplied by the alpha component divided by 255. (If RR, GG, or BB has a higher value than the alpha channel, the results are undefined.) Certain operations (such as image composition using alpha blending) are faster using premultiplied ARGB32 than with plain ARGB32. QImage::Format_RGB16 7 The image is stored using a 16-bit RGB format (5-6-5). QImage::Format_ARGB8565_Premultiplied 8 The image is stored using a premultiplied 24-bit ARGB format (8-5-6-5). QImage::Format_RGB666 9 The image is stored using a 24-bit RGB format (6-6-6). The unused most significant bits is always zero. QImage::Format_ARGB6666_Premultiplied 10 The image is stored using a premultiplied 24-bit ARGB format (6-6-6-6). QImage::Format_RGB555 11 The image is stored using a 16-bit RGB format (5-5-5). The unused most significant bit is always zero. QImage::Format_ARGB8555_Premultiplied 12 The image is stored using a premultiplied 24-bit ARGB format (8-5-5-5). QImage::Format_RGB888 13 The image is stored using a 24-bit RGB format (8-8-8). QImage::Format_RGB444 14 The image is stored using a 16-bit RGB format (4-4-4). The unused bits are always zero. QImage::Format_ARGB4444_Premultiplied 15 The image is stored using a premultiplied 16-bit ARGB format (4-4-4-4). QImage::Format_RGBX8888 16 The image is stored using a 32-bit byte-ordered RGB(x) format (8-8-8-8). This is the same as the Format_RGBA8888 except alpha must always be 255. QImage::Format_RGBA8888 17 The image is stored using a 32-bit byte-ordered RGBA format (8-8-8-8). Unlike ARGB32 this is a byte-ordered format, which means the 32bit encoding differs between big endian and little endian architectures, being respectively (0xRRGGBBAA) and (0xAABBGGRR). The order of the colors is the same on any architecture if read as bytes 0xRR,0xGG,0xBB,0xAA. QImage::Format_RGBA8888_Premultiplied 18 The image is stored using a premultiplied 32-bit byte-ordered RGBA format (8-8-8-8). QImage::Format_BGR30 19 The image is stored using a 32-bit BGR format (x-10-10-10). QImage::Format_A2BGR30_Premultiplied 20 The image is stored using a 32-bit premultiplied ABGR format (2-10-10-10). QImage::Format_RGB30 21 The image is stored using a 32-bit RGB format (x-10-10-10). QImage::Format_A2RGB30_Premultiplied 22 The image is stored using a 32-bit premultiplied ARGB format (2-10-10-10). QImage::Format_Alpha8 23 The image is stored using an 8-bit alpha only format. QImage::Format_Grayscale8 24 The image is stored using an 8-bit grayscale format. Note: Drawing into a QImage with QImage::Format_Indexed8 is not supported. Note: Do not render into ARGB32 images using QPainter. Using QImage::Format_ARGB32_Premultiplied is significantly faster. Note: Formats with more than 8 bit per color channel will only be processed by the raster engine using 8 bit per color. See also format() and convertToFormat(). This enum type is used to describe how pixel values should be inverted in the invertPixels() function. QImage::InvertRgb 0 Invert only the RGB values and leave the alpha channel unchanged. QImage::InvertRgba 1 Invert all channels, including the alpha channel. Constructs an image with the given size and format. A null image is returned if memory cannot be allocated. Warning: This will create a QImage with uninitialized data. Call fill() to fill the image with an appropriate pixel value before drawing onto it with QPainter. Constructs an image with the given width, height and format. A null image will be returned if memory cannot be allocated. Constructs an image with the given width, height and format, that uses an existing memory buffer, data. The width and height must be specified in pixels, data must be 32-bit aligned, and each scanline of data in the image must also be 32-bit aligned. The buffer must remain valid throughout the life of the QImage and all copies that have not been modified or otherwise detached from the original buffer. The image does not delete the buffer at destruction. You can provide a function pointer cleanupFunction along with an extra pointer cleanupInfo that will be called when the last copy is destroyed. If format is an indexed color format, the image color table is initially empty and must be sufficiently expanded with setColorCount() or setColorTable() before the image is used. Constructs an image with the given width, height and format, that uses an existing read-only memory buffer, data. The width and height must be specified in pixels, data must be 32-bit aligned, and each scanline of data in the image must also be 32-bit aligned. Unlike the similar QImage constructor that takes a non-const data buffer, this version will never alter the contents of the buffer. For example, calling QImage::bits() will return a deep copy of the image, rather than the buffer passed to the constructor. This allows for the efficiency of constructing a QImage from raw data, without the possibility of the raw data being changed. Constructs an image with the given width, height and format, that uses an existing memory buffer, data. The width and height must be specified in pixels. bytesPerLine specifies the number of bytes per line (stride). Constructs an image from the given xpm image. Make sure that the image is a valid XPM image. Errors are silently ignored. The extra const makes the entire definition read-only, which is slightly more efficient (e.g., when the code is in a shared library) and able to be stored in ROM with the application. Constructs an image and tries to load the image from the file with the given fileName. The loader attempts to read the image using the specified format. If the format is not specified (which is the default), the loader probes the file for a header to guess the file format. If the loading of the image failed, this object is a null image. The file name can either refer to an actual file on disk or to one of the application's embedded resources. See the Resource System overview for details on how to embed images and other resource files in the application's executable. See also isNull() and Reading and Writing Image Files. Constructs a shallow copy of the given image. For more information about shallow copies, see the Implicit Data Sharing documentation. Move-constructs a QImage instance, making it point at the same object that other was pointing to. Destroys the image and cleans up. Returns true if all the colors in the image are shades of gray (i.e. their red, green and blue components are equal); otherwise false. Note that this function is slow for images without color table. Returns the number of bit planes in the image. The number of bit planes is the number of bits of color and transparency information for each pixel. This is different from (i.e. smaller than) the depth when the image format contains unused bits. See also depth(), format(), and Image Formats. Returns a pointer to the first pixel data. This is equivalent to scanLine(0). Note that QImage uses implicit data sharing. This function performs a deep copy of the shared pixel data, thus ensuring that this QImage is the only one using the current return value. See also scanLine(), byteCount(), and constBits(). Note that QImage uses implicit data sharing, but this function does not perform a deep copy of the shared pixel data, because the returned data is const. Returns the number of bytes occupied by the image data. See also bytesPerLine(), bits(), and Image Information. Returns the number of bytes per image scanline. This is equivalent to byteCount() / height(). Returns a number that identifies the contents of this QImage object. Distinct QImage objects can only have the same key if they refer to the same contents. The key will change when the image is altered. Returns the color in the color table at index i. The first color is at index 0. The colors in an image's color table are specified as ARGB quadruplets (QRgb). Use the qAlpha(), qRed(), qGreen(), and qBlue() functions to get the color value components. See also setColor(), pixelIndex(), and Pixel Manipulation. Returns the size of the color table for the image. Notice that colorCount() returns 0 for 32-bpp images because these images do not use color tables, but instead encode pixel values as ARGB quadruplets. See also setColorCount() and Image Information. See also setColorTable(), colorCount(), and color(). Returns a pointer to the first pixel data. See also bits() and constScanLine(). Returns a pointer to the pixel data at the scanline with index i. The first scanline is at index 0. The scanline data is aligned on a 32-bit boundary. See also scanLine() and constBits(). Returns a copy of the image in the given format. The specified image conversion flags control how the image data is handled during the conversion process. Returns a copy of the image converted to the given format, using the specified colorTable. Conversion from 32 bit to 8 bit indexed is a slow operation and will use a straightforward nearest color approach, with no dithering. Returns a sub-area of the image as a new image. The returned image is copied from the position (rectangle.x(), rectangle.y()) in this image, and will always have the size of the given rectangle. In areas beyond this image, pixels are set to 0. For 32-bit RGB images, this means black; for 32-bit ARGB images, this means transparent black; for 8-bit images, this means the color with index 0 in the color table which can be anything; for 1-bit images, this means Qt::color0. If the given rectangle is a null rectangle the entire image is copied. The returned image is copied from the position (x, y) in this image, and will always have the given width and height. In areas beyond this image, pixels are set to 0. Builds and returns a 1-bpp mask from the alpha buffer in this image. Returns a null image if the image's format is QImage::Format_RGB32. The flags argument is a bitwise-OR of the Qt::ImageConversionFlags, and controls the conversion process. Passing 0 for flags sets all the default options. The returned image has little-endian bit order (i.e. the image's format is QImage::Format_MonoLSB), which you can convert to big-endian (QImage::Format_Mono) using the convertToFormat() function. See also createHeuristicMask() and Image Transformations. Creates and returns a 1-bpp heuristic mask for this image. The function works by selecting a color from one of the corners, then chipping away pixels of that color starting at all the edges. The four corners vote for which color is to be masked away. In case of a draw (this generally means that this function is not applicable to the image), the result is arbitrary. If clipTight is true (the default) the mask is just large enough to cover the pixels; otherwise, the mask is larger than the data pixels. Note that this function disregards the alpha buffer. See also createAlphaMask() and Image Transformations. Creates and returns a mask for this image based on the given color value. If the mode is MaskInColor (the default value), all pixels matching color will be opaque pixels in the mask. If mode is MaskOutColor, all pixels matching the given color will be transparent. See also createAlphaMask() and createHeuristicMask(). Returns the depth of the image. The image depth is the number of bits used to store a single pixel, also called bits per pixel (bpp). The supported depths are 1, 8, 16, 24 and 32. See also bitPlaneCount(), convertToFormat(), Image Formats, and Image Information. Returns the device pixel ratio for the image. This is the ratio between device pixels and device independent pixels. See also setDevicePixelRatio() and QImageReader. Returns the number of pixels that fit horizontally in a physical meter. Together with dotsPerMeterY(), this number defines the intended scale and aspect ratio of the image. See also setDotsPerMeterX() and Image Information. Returns the number of pixels that fit vertically in a physical meter. Together with dotsPerMeterX(), this number defines the intended scale and aspect ratio of the image. See also setDotsPerMeterY() and Image Information. Fills the entire image with the given pixelValue. If the depth of this image is 1, only the lowest bit is used. If you say fill(0), fill(2), etc., the image is filled with 0s. If you say fill(1), fill(3), etc., the image is filled with 1s. If the depth is 8, the lowest 8 bits are used and if the depth is 16 the lowest 16 bits are used. Note: QImage::pixel() returns the color of the pixel at the given coordinates while QColor::pixel() returns the pixel value of the underlying window system (essentially an index value), so normally you will want to use QImage::pixel() to use a color from an existing image or QColor::rgb() to use a specific color. See also depth() and Image Transformations. Fills the entire image with the given color. If the depth of the image is 1, the image will be filled with 1 if color equals Qt::color1; it will otherwise be filled with 0. If the depth of the image is 8, the image will be filled with the index corresponding the color in the color table if present; it will otherwise be filled with 0. This function was introduced in Qt 4.8. Fills the image with the given color, described as a standard global color. Returns the format of the image. See also load(), save(), and Reading and Writing Image Files. Loads an image from the given QByteArray data. Returns true if the image has a format that respects the alpha channel, otherwise returns false. Returns the height of the image. Inverts all pixel values in the image. The given invert mode only have a meaning when the image's depth is 32. The default mode is InvertRgb, which leaves the alpha channel unchanged. If the mode is InvertRgba, the alpha bits are also inverted. Inverting an 8-bit image means to replace all pixels using color index i with a pixel using color index 255 minus i. The same is the case for a 1-bit image. Note that the color table is not changed. If the image has a premultiplied alpha channel, the image is first converted to ARGB32 to be inverted and then converted back. For 32-bit images, this function is equivalent to allGray(). For color indexed images, this function returns true if color(i) is QRgb(i, i, i) for all indexes of the color table; otherwise returns false. See also allGray() and Image Formats. Returns true if it is a null image, otherwise returns false. A null image has all parameters set to zero and no allocated data. Loads an image from the file with the given fileName. Returns true if the image was successfully loaded; otherwise invalidates the image and returns false. The loader attempts to read the image using the specified format, e.g., PNG or JPG. If format is not specified (which is the default), the loader probes the file for a header to guess the file format. See also Reading and Writing Image Files. This function reads a QImage from the given device. This can, for example, be used to load an image directly into a QByteArray. Loads an image from the first len bytes of the given binary data. Returns true if the image was successfully loaded; otherwise invalidates the image and returns false. Returns a mirror of the image, mirrored in the horizontal and/or the vertical direction depending on whether horizontal and vertical are set to true or false. Note that the original image is not changed. Returns the number of pixels by which the image is intended to be offset by when positioning relative to other images. See also setOffset() and Image Information. Returns the color of the pixel at the given position. If the position is not valid, the results are undefined. Warning: This function is expensive when used for massive pixel manipulations. Use constBits() or constScanLine() when many pixels needs to be read. See also setPixel(), valid(), constBits(), constScanLine(), and Pixel Manipulation. Returns the color of the pixel at coordinates (x, y). Returns the color of the pixel at the given position as a QColor. If the position is not valid, an invalid QColor is returned. This function was introduced in Qt 5.6. See also setPixelColor(), setPixel(), valid(), constBits(), constScanLine(), and Pixel Manipulation. Returns the color of the pixel at coordinates (x, y) as a QColor. Returns the pixel index at the given position. If position is not valid, or if the image is not a paletted image (depth() > 8), the results are undefined. See also valid(), depth(), and Pixel Manipulation. Returns the pixel index at (x, y). Returns the enclosing rectangle (0, 0, width(), height()) of the image. Returns a QImage in which the values of the red and blue components of all pixels have been swapped, effectively converting an RGB image to an BGR image. The original QImage is not changed. Saves the image to the file with the given fileName, using the given image file format and quality factor. If format is 0, QImage will attempt to guess the format by looking at fileName's suffix. The quality factor must be in the range 0 to 100 or -1. Specify 0 to obtain small compressed files, 100 for large uncompressed files, and -1 (the default) to use the default settings. Returns true if the image was successfully saved; otherwise returns false. This function writes a QImage to the given device. Returns a copy of the image scaled to a rectangle defined by the given size according to the given aspectRatioMode and transformMode. If aspectRatioMode is Qt::IgnoreAspectRatio, the image is scaled to size. If aspectRatioMode is Qt::KeepAspectRatio, the image is scaled to a rectangle as large as possible inside size, preserving the aspect ratio. If aspectRatioMode is Qt::KeepAspectRatioByExpanding, the image is scaled to a rectangle as small as possible outside size, preserving the aspect ratio. If the given size is empty, this function returns a null image. See also isNull() and Image Transformations. Returns a copy of the image scaled to a rectangle with the given width and height according to the given aspectRatioMode and transformMode. If either the width or the height is zero or negative, this function returns a null image. Returns a scaled copy of the image. The returned image is scaled to the given height using the specified transformation mode. This function automatically calculates the width of the image so that the ratio of the image is preserved. If the given height is 0 or negative, a null image is returned. Returns a scaled copy of the image. The returned image is scaled to the given width using the specified transformation mode. This function automatically calculates the height of the image so that its aspect ratio is preserved. If the given width is 0 or negative, a null image is returned. Warning: If you are accessing 32-bpp image data, cast the returned pointer to QRgb* (QRgb has a 32-bit size) and use it to read/write the pixel value. You cannot use the uchar* pointer directly, because the pixel format depends on the byte order on the underlying platform. Use qRed(), qGreen(), qBlue(), and qAlpha() to access the pixels. See also bytesPerLine(), bits(), Pixel Manipulation, and constScanLine(). Sets the color at the given index in the color table, to the given to colorValue. The color value is an ARGB quadruplet. If index is outside the current size of the color table, it is expanded with setColorCount(). See also color(), colorCount(), setColorTable(), and Pixel Manipulation. Resizes the color table to contain colorCount entries. If the color table is expanded, all the extra colors will be set to transparent (i.e qRgba(0, 0, 0, 0)). When the image is used, the color table must be large enough to have entries for all the pixel/index values present in the image, otherwise the results are undefined. See also colorCount(), colorTable(), setColor(), and Image Transformations. Sets the color table used to translate color indexes to QRgb values, to the specified colors. See also colorTable(), setColor(), and Image Transformations. Sets the device pixel ratio for the image. This is the ratio between image pixels and device-independent pixels. QPainters that are opened on the image will be scaled. For example, painting on a 200x200 image if with a ratio of 2.0 will result in effective (device-independent) painting bounds of 100x100. Code paths in Qt that calculate layout geometry based on the image size will take the ratio into account: QSize layoutSize = image.size() / image.devicePixelRatio() The net effect of this is that the image is displayed as high-DPI image rather than a large image (see Drawing High Resolution Versions of Pixmaps and Images). Sets the number of pixels that fit horizontally in a physical meter, to x. Together with dotsPerMeterY(), this number defines the intended scale and aspect ratio of the image, and determines the scale at which QPainter will draw graphics on the image. It does not change the scale or aspect ratio of the image when it is rendered on other paint devices. See also dotsPerMeterX() and Image Information. Sets the number of pixels that fit vertically in a physical meter, to y. Together with dotsPerMeterX(), this number defines the intended scale and aspect ratio of the image, and determines the scale at which QPainter will draw graphics on the image. It does not change the scale or aspect ratio of the image when it is rendered on other paint devices. See also dotsPerMeterY() and Image Information. Sets the number of pixels by which the image is intended to be offset by when positioning relative to other images, to offset. See also offset() and Image Information. Sets the pixel index or color at the given position to index_or_rgb. If the image's format is either monochrome or paletted, the given index_or_rgb value must be an index in the image's color table, otherwise the parameter must be a QRgb value. If position is not a valid coordinate pair in the image, or if index_or_rgb >= colorCount() in the case of monochrome and paletted images, the result is undefined. Warning: This function is expensive due to the call of the internal detach() function called within; if performance is a concern, we recommend the use of scanLine() or bits() to access pixel data directly. See also pixel() and Pixel Manipulation. Sets the pixel index or color at (x, y) to index_or_rgb. Sets the color at the given position to color. If position is not a valid coordinate pair in the image, or the image's format is either monochrome or paletted, the result is undefined. See also pixelColor(), pixel(), bits(), scanLine(), and Pixel Manipulation. Sets the pixel color at (x, y) to color. Sets the image text to the given text and associate it with the given key. If you just want to store a single text block (i.e., a "comment" or just a description), you can either pass an empty key, or use a generic key like "Description". The image text is embedded into the image data when you call save() or QImageWriter::write(). You can use QImageWriter::supportedImageFormats() to find out which image formats are available to you. See also text() and textKeys(). Returns the size of the image, i.e. its width() and height(). Returns a smoothly scaled copy of the image. The returned image has a size of width w by height h pixels. Swaps image other with this image. This operation is very fast and never fails. Returns the image text associated with the given key. If the specified key is an empty string, the whole image text is returned, with each key-text pair separated by a newline. See also setText() and textKeys(). Returns the text keys for this image. You can use these keys with text() to list the image text for a certain key. Returns a copy of the image that is transformed using the given transformation matrix and transformation mode. The transformation matrix is internally adjusted to compensate for unwanted translation; i.e. the image produced is the smallest image that contains all the transformed points of the original image. Use the trueMatrix() function to retrieve the actual matrix used for transforming an image. See also trueMatrix() and Image Transformations. Unlike the other overload, this function can be used to perform perspective transformations on images. Returns the actual matrix used for transforming an image with the given width, height and matrix. When transforming an image using the transformed() function, the transformation matrix is internally adjusted to compensate for unwanted translation, i.e. transformed() returns the smallest image containing all transformed points of the original image. This function returns the modified matrix, which maps points correctly from the original image into the new image. See also transformed() and Image Transformations. Unlike the other overload, this function creates transformation matrices that can be used to perform perspective transformations on images. Returns true if pos is a valid coordinate pair within the image; otherwise returns false. See also rect() and QRect::contains(). Returns true if QPoint(x, y) is a valid coordinate pair within the image; otherwise returns false. Returns the width of the image. Returns the image as a QVariant. Returns true if this image and the given image have different contents; otherwise returns false. The comparison can be slow, unless there is some obvious difference, such as different widths, in which case the function will return quickly. Assigns a shallow copy of the given image to this image and returns a reference to this image. See also copy() and QImage(). Move-assigns other to this QImage instance. Returns true if this image and the given image have the same contents; otherwise returns false. The comparison can be slow, unless there is some obvious difference (e.g. different size or format), in which case the function will return quickly. This typedef was introduced in Qt 5.0. Writes the given image to the given stream as a PNG image, or as a BMP image if the stream's version is 1. Note that writing the stream to a file will not produce a valid image file. See also QImage::save() and Serializing Qt Data Types. Reads an image from the given stream and stores it in the given image. See also QImage::load() and Serializing Qt Data Types.